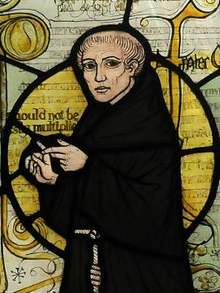 William of Ockham was a Franciscan friar who lived in the 14th century. He was born around 1285, in Ockham, Surrey, England, and died April 9, 1347 in Munich. He was a philosopher and theologian. He is most famous for inventing Occam's razor. He wrote about logic, epistemology, natural philosophy, political philosophy, metaphysics and ethics. 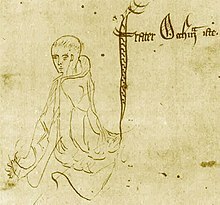 William of Ockham went to school at the University of Oxford, where he studied theology. After he graduated, he became a teacher of philosophy at the school. However, the Church did not like the ideas he was teaching, and brought him to court on charges of heresy in 1327. Because he was afraid he would be executed, William of Ockham fled the school and spent the rest of his life living with a group of friars who also did not like the large power that the Church had. This page was last changed on 22 December 2017, at 11:12.